We’ll cover everything you need to know about taking care of outdoor outerwear, equipment, and accessories—from washing and drying to hole-patching and seam-fixing. You’ll learn pro tips for preventative maintenance, repair kit essentials, item-specific repairs (including tents, jackets, bags, and packs), and on-the-trail fixes. Plus, the first 100 people who enroll will receive a free gear repair kit. We know you have a busy schedule, so we’ve designed this course to be taken at your own pace. You’ll learn through a variety of interactive formats, including video instruction, step-by-step photo descriptions, and more. Each session builds on the last, and, while we’ve designed the course in 7 parts, you can take it as quickly or slowly as you want. Plus, once you purchase the course, the lessons are yours forever. 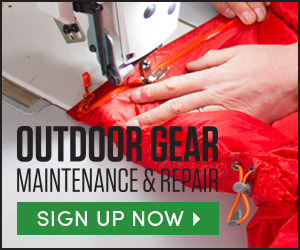 Boulder Mountain Repair is an independent shop that specializes in reviving and restoring gear and has more than two decades of experience fixing and cleaning technical outdoor gear. Serving both the local community in Boulder, Colorado and mail-in customers around the country, we have made more than 30,000 repairs. As the largest repair service in the Rocky Mountain region, Boulder Mountain Repair features industrial repair and cleaning equipment. 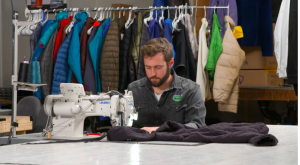 We fix and clean down garments, technical shells, sleeping bags, tents, backpacks, and more with high-end equipment, brand-name treatments, and even custom modifications. Do I need specific equipment to take this course? The equipment you’ll need will depend on the specific repair you’re trying to do. The biggest thing you’ll need is to have access to a good sewing machine. We’ll cover what specific repair materials you might need down the road. Do I need to be a sewing expert? You do not need to be a sewing expert. The course is tailored to anyone who wants to take better care of their outdoor gear, including jackets, tents, backpacks, and more. How much time do I need to complete the course? This 7-part course is designed to be taken at your own pace. The time commitment for each lesson depends on the specific repair, and your experience as a seamstress. Can I download the course? While the course is unavailable to download, it’s accessible from anywhere with internet access. Contact AIM Adventure U customer support. We are located in East Boulder, 3 buildings north of the Upslope Brewery and across the street from the FedEx building.